ON MARCH 12, 1918, Elizabeth Robbins wrote a two-page letter to a stranger in a war office more than 1000km away from her little home in country NSW. The letter, in a halting barely legible cursive script, was a simple plea from a kind devoted mother whose eldest son died in a foreign land surrounded by strangers. "Dear sir, I am a bad hand at writing under these circumstances." The simple eloquent sentence belies the horror and heartache Mrs Robbins would have felt on learning her "good lad" died after being shot in the back during intense fighting on a battlefield in Boulogne, France. "I like all mothers who have lost their sons, would like to know about his personal belongings which I know he had some," she continues. "I only want them for a keepsake in memory of him who was a good lad to his parents." It is a heartbreakingly beautiful humble letter laced with civility and politeness. And it never fails to draw tears from her great-granddaughters Larraine Webster and Georgia Lawrance. 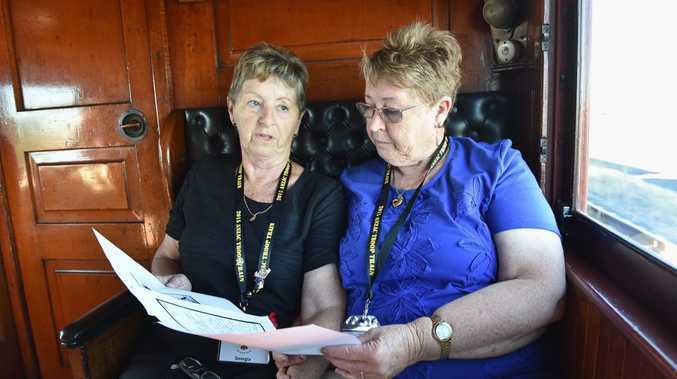 Their great-grandmother's heartache is high in the sisters' minds as they travel across Queensland on the Anzac troop train re-enactment this week. 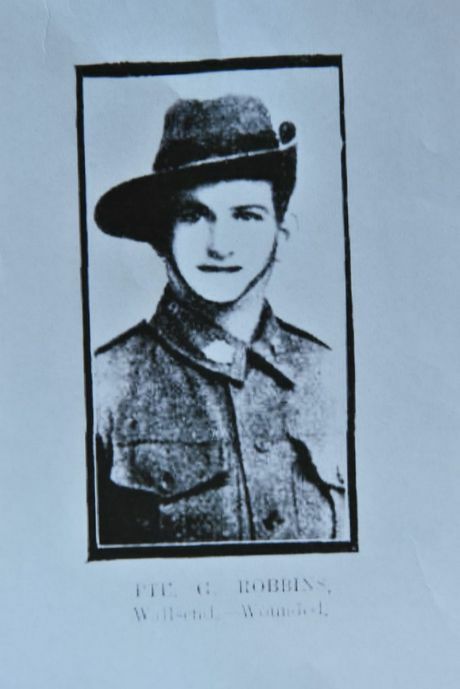 George Robbins joined Australia's war efforts in 1915; six months shy of his 20th birthday. He died two years and 72 days later. His family learnt of his death shortly after, but there was a long delay in his belongings being returned. His devastated mother, seeking a small memento to remember her son by, decided to act. "Dear sir, I hope you will take no offence at me writing but place yourself in my position, losing a son," she writes. "I hope dear sir you will do your best for me. "I trust I am no bother to you sir, but heartbroken I would like something of his belongings." 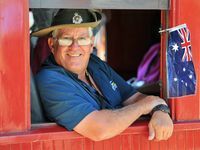 "We never met her," Mrs Lawrance, from Degilbo, between Maryborough and Bundaberg, says. "But she was a kindly person, apparently, and well loved by her children." "My grandfather spoke highly of her," Mrs Webster, a 68-year-old grandmother from Lake Macquarie in NSW, says. The letter, which was uncovered during a war records search, is one of the sisters' most treasured possessions. "I found it very moving," Mrs Lawrance, 66, says of first reading the letter. "The tone she used was very civil - the civility was very prominent. "I think of how sad she must have been because her son had died so far away and she had absolutely nothing of his from the last moments of his life." Mrs Webster says she still feels sad when she reads it. "I can cry - it just cuts you that way," she says. Mrs Lawrance, who is a nurse and a mother of two and grandmother of one, understands Mrs Robbins's pain. "She would have been sad that he died without any of his family nearby," she says. "Mothers are so for their sons - mothers are really fond of their sons. "I would think she would be thinking of him as a little boy and thinking how sad and scared he would have been without her there to comfort him." 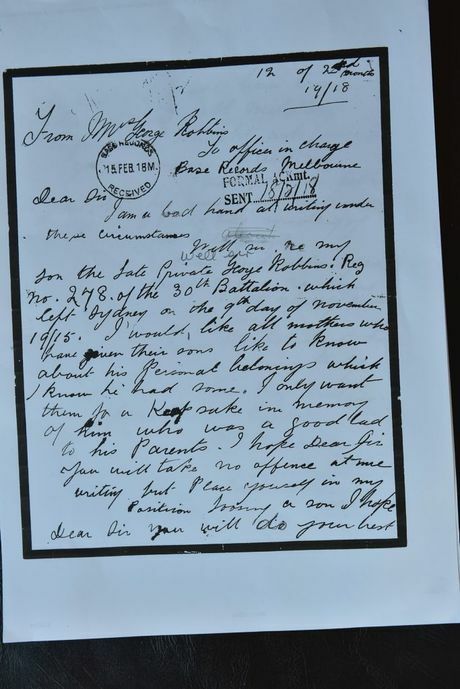 Eventually the Australian War Office sent a small plain parcel to the Robbins family. Inside were two wallets, a coin, an ID tag and a pack of cards. The belongings, so desperately craved by a grieving mother, are no longer in the family's possession. "We don't know where they are," Mrs Webster says. Understanding the struggles Mrs Robbins went through and the heroics of their great uncle is vital to the pair. As well as carrying the letter, Mrs Lawrance and Mrs Webster proudly wear replicas of George's medals. "We want to keep their memory alive," Mrs Webster says. "It's really important." I am a bad hand at writing under these circumstances. Well sir, re my son the late Private George Robbins registration number 278 of the 30th Battalion which left Sydney on the 19th day of November 1915. I like all mothers who have lost their sons, would like to know about his personal belongings which I know he had some. I only want them for a keepsake in memory of him who was a good lad to his parents. Dear sir, I hope you will take no offence at me writing but place yourself in my position, losing a son. I hope dear sir you will do your best for me. I have been treated splendid with all military information I might ask. I have always got an answer of civility. I trust I am no bother to you sir, but heartbroken I would like something of his belongings. If any information you might require re same I would gladly give you. I have the honour to be yours truly.